The Lord Ruler has been defeated, killed by Vin herself, drawing on the power of the mists. But revolution comes at a cost, and that cost was Kelsier, the famed Survivor of Hathsin. So now what? The Well of Ascension tackles the age old question of how to rule and keep the kingdom now that you’ve usurped the throne. Most of the predominant noblemen have left Luthadel and Elend Venture takes over rule, trying hard to balance maintaining order with his philosophical ideals, while Kelsier’s crew serves in his council. But Elend’s reign is not uncontested and self-proclaimed kings are knocking down his door, laying siege to Luthadel and imposing threats never before encountered. 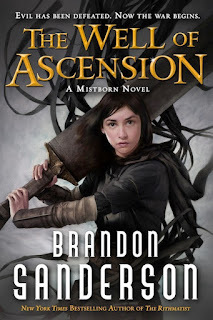 I called Mistborn, The Final Empire the heroic fantasy of this generation because it hit all the high notes of a hero’s tale while including the grit and grimdarkness so intrinsic to the current movement in the genre. But in The Well of Ascension, much of that is lost. Sure, there is war and gore, but our protagonists are no longer rebel thieves living on the fringes. Now, they are just the good guys, struggling to do what is right and to make everyone happy. How passé. Elend especially, what a dull, drab character he is. In the first book he was snarky and rebellious, reading banned books and discussing revolution. Now, he’s trying to live up to his ideals but has frustratingly lost his edge, which makes him boring to read. And because of his childish relationship with Vin, he really drags her down with him. Vin spends most of her time thinking about how she loves Elend and how she trusts Elend and how she wants to protect Elend, rendering her inner dialog excruciating at times. Their relationship, which is flat even through a YA lens, has zero chemistry or sexual tension. The age difference is also quite unsettling. Even though they are only a few years apart (Vin in her late teens and Elend in his early twenties), Elend is much more mature than Vin, her having only just begun to find herself and uncoil from hiding in corners. I still hold to the notion that in the end of The Final Empire, Vin should have walked away instead of jumping down to Elend. It would have giving their future relationship and desire for one another time to build. As it stands, Vin and Elend’s romantic musings add a level of juvenility to the story that I think even the YA audience would find contrived. Lucky for the reader though, Sanderson writes incredible secondary characters. Sazed in particular is fascinating and his journey adds much more to the story than just entertainment. In fact, all of the secondary characters are a pleasure to read, and I found myself looking forward to chapters with Sazed, Spook, and Marsh far more than to those containing Vin, to my surprise. What is most exciting about this sequel is learning more about the magic system and products thereof. 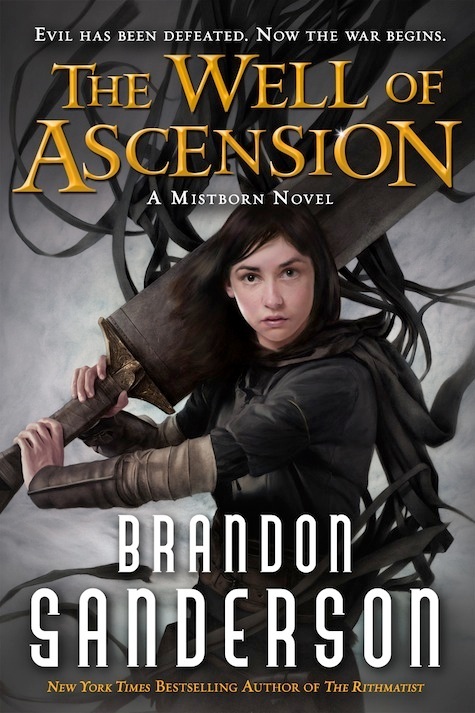 Sanderson introduces us to new creatures, like the Koloss, and gives us a more in depth characterization of the Kandra through the brilliant character TenSoon. And, of course, we still have Vin’s fight scenes, which are choreographed so beautifully with the written word that they beg to be seen on screen. Reference: Sanderson, Brandon. The Well of Ascension [Tor, 2007].